MORAGA, Calif. (AP) — Jock Landale had 32 points and 14 rebounds and No. 16 Saint Mary’s pulled away in the second half to beat BYU 75-62 on Thursday night, extending the Gaels’ winning streak to 15 . The 15-game winning streak matches the longest in Saint Mary’s history. The Gaels also won 15 straight in 2008-09. Emmett Naar added 13 points and 12 assists and Evan Fitzner made a key 3-pointer late to help the Gaels (20-2, 9-0 West Coast Conference) hold on for their fifth consecutive win over the Cougars (17-5, 6-3). Naar, who came into the game second in the country for assists, needs 33 more to break the school’s career record. Landale was dominant all game. He helped the Gaels get out to an early lead in a back-and-forth first half then scored 18 in the second half, including 11 straight during one stretch. Landale also made a nifty assist when he passed to Naar cutting down the lane for an easy bucket. Naar returned the favor with an alley-oop pass to the Saint Mary’s big man for a dunk that put the Gaels up 61-53. After McKay Cannon’s 3-pointer made it 61-56, Landale made two free throws, Fitzner hit a 3-pointer and Landale added a three-point play. It’s the sixth time this season that Landale has scored 30 or more. He also has double-doubles in 12 of the last 14 games. TJ Haws scored 15 points, Yoeli Childs added 14 and Elijah Bryant had 13 points and nine assist for BYU. The Gaels won in their first game since returning to the Top 25 after a two-month absence. BYU stayed close early despite a strong effort from Landale in the first half. The reigning conference player of the week, Landale was dominant down low. 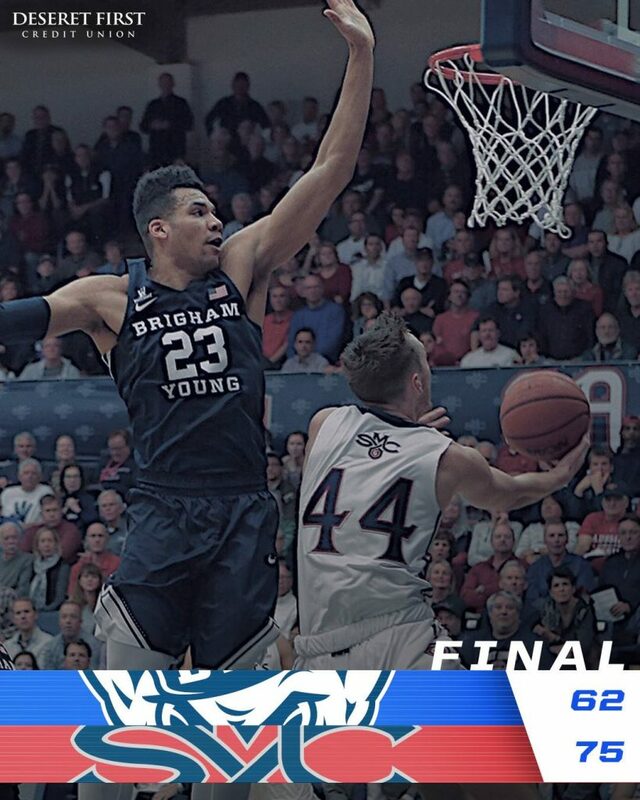 He scored on a pair of up-and-under moves, made a dunk off an assist from Naar and added two short layups despite BYU’s collapsing defense in the paint. His lone misses came on a rushed 3-pointer with the shot clock running down and a shot under the basket that hit the rim going up. BYU: The Cougars kept it close in the first half, but had no answer for Landale. Childs had trouble defending him and Luke Worthington missed most of the second half in foul trouble. BYU was a respectable 7 of 17 on 3-pointers and forced turnovers on Saint Mary’s final five possessions of the first half. Saint Mary’s: It clearly wasn’t the cleanest of wins for coach Randy Bennett’s teams, which is why Landale was so pivotal. Naar also came up big, but no other Gaels player reached double figures and Saint Mary’s had problems taking care of the ball – both points of emphasis by Bennett. BYU: The Cougars host Pacific on Saturday. Saint Mary’s: The Gaels host Portland on Saturday night.